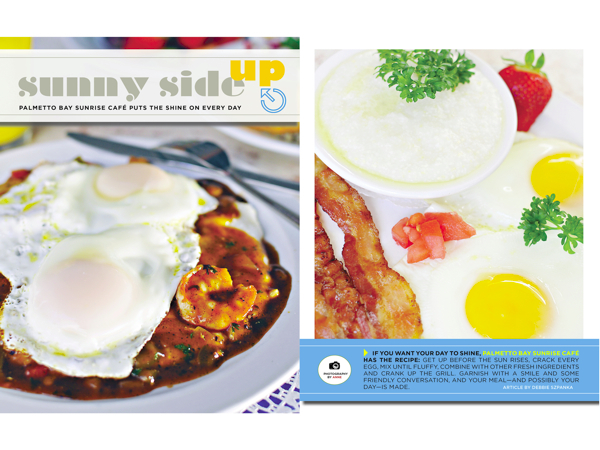 Hilton Head Magazines: CH2/CB2: Sunny Side Up - Palmetto Bay Sunrise Cafe Put the Shine on Every Day! 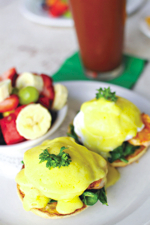 If you want your day to shine, Palmetto Bay Sunrise Café has the recipe: Get up before the sun rises, crack every egg, mix until fluffy, combine with other fresh ingredients and crank up the grill. Garnish with a smile and some friendly conversation, and your meal—and possibly your day—is made. His buddy Bill Shanholtz said this is his way of giving his wife her quiet time. “I heard the cafe gives you a free birthday meal,” Shanholtz said. “So, I guess if I pay for 364 meals, my 365th is free,” he said with a laugh. Watts, who now frequently leads photographic tours through the salt marshes, is sometimes there before the doors open at 6 a.m. “It really is a fun way to start the day,” he said. Leslie and Paul Stewart first opened the breakfast and lunch restaurant in 2002, after more than a decade of working the island’s food and beverage industry. Leslie was a server and “Stew,” as his friends call him, worked as a chef in several island locations. The first day, they served 35 people in the restaurant, Stewart said. Now, a decade later, the cafe feeds more than 500 on a Sunday. What makes their restaurant different is that they literally and figuratively crack every egg. “Each egg is cracked, because to make fluffy omelets, air has to be involved, Leslie said. The culinary couple says they pride themselves in using fresh ingredients, and that’s what makes their restaurant different. Every day, the crew at Palmetto Bay Sunrise Cafe makes hollandaise sauce, stratas, quiches, soups, crab cakes, salad dressings and sausage gravy. The kitchen staff also hand cuts their steaks daily and deveins shrimp, which only comes from domestic waters. Care is taken to make each meal homemade, and that adds to the family feel of the food. 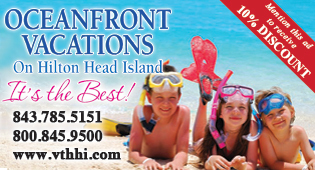 However the food and friendliness are not the only elements that make it feel like a family. The other reason is that it really is. Carter’s daughter Rachael also works there, and Lisa said she wouldn’t want her to work anywhere else as she starts her career. “I have worked at corporate places in Washington, D.C., and nothing comes close to the quality of the food and environment as here. 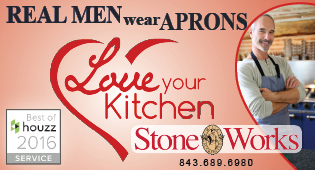 The feeling comes from owners, generates through their staff and flows to the customer,” Lisa said. Just two years ago, the Palmetto Bay Sunrise Café family lost one of their own, and when asked about Linda, the “family” members still gather around to add what she meant to each of them. Linda Linden-MacNeille, 46, died of cancer, and remembering her last days still brings tears to Leslie’s eyes. Leslie remembers Linda visiting the restaurant for one of her last happy hours “with the girls” just days before she passed. That was the last time she ventured out of her house. A few days later, her family of fellow servers visited her at her home and had their final happy hour on her deck. While Linda couldn’t talk, she was among her favorite people hours before she died. The restaurant and Bluffton’s Cornerstone Grill Foundation, which was a part of the former Cornerstone Grill in the Tanger Outlets, named themselves “Team Linda” and raised more than $20,000 to help pay for her medical bills. A framed picture of Linda graces the wall of the Café. And every time someone drops a glass or breaks a plate, Stewart says he thinks she is right here. “She had the drops, and now when I hear a dish crack, I feel her presence,” he explained. According to Carter, the way they gather around Linda is the way they operate the restaurant. “The concept is that no one should want for anything—whether you are staff or a customer—that’s special,” he said. Palmetto Bay Sunrise Café is open seven days a week, from 6 a.m.-2 p.m. Monday through Friday and until 3 p.m. on the weekends. Breakfast is served all day. Check out the different variations of eggs Benedict, from its original city ham, crab cake, smoked salmon or shrimp and spinach. Different quiches and stratas are also made every day along with the staples of biscuits and gravy, pancakes, French toast and omelets. 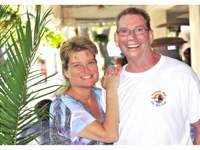 Leslie and Paul Stewart first opened Palmetto Bay Sunrise cafe in 2002. 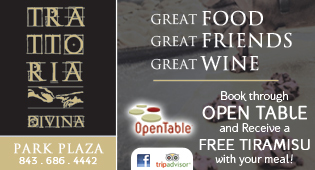 Lunch options include fresh seafood such as Apalachicola oysters, crab wontons, and a variety of shrimp dishes. Among the most popular lunch items are the Café’s homemade she-crab soup, potato crusted flounder, shrimp Provencal and a slew of fresh sandwiches. 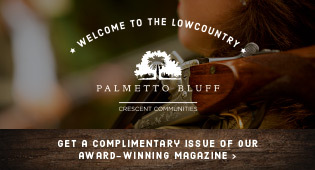 Call 843.686.3232 or visit www.palmettobaysunrisecafe.com for more information.